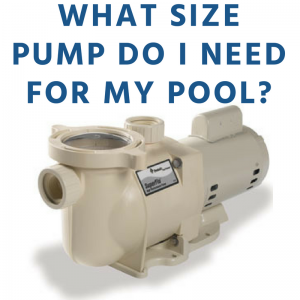 What Size Pump Should I Get for My Pool? If you're looking to build a new pool or simply looking to replace a pool pump you may find yourself asking, "Is a larger horsepower (HP) pool pump always better". PRO TIP: No matter which type of pump you choose, you’ll want to make sure you properly select the correct pump and filter combination. The pump needs to be sized appropriately compared to the filter’s flow rate. Choosing a pump with a higher flow rate than the filter will put strain on both the pump and filter, reducing life and efficiency of each. This means that you would not want to choose a pump designed to be used with 2" plumbing piece, and then use a filter designed to be used with 1 1/2" plumbing piece. Proper pairing of these two units is essential for a pleasant pool experience. √ If choosing a pump with a 1-1/2” inlet/outlet, you should choose a filter with a 1-1/2” inlet/outlet as well. However, a pump with a 1-1/2” inlet/outlet can work with a filter with a 2” inlet/outlet if needed to. X You would not want to attempt to use a pump with 2” inlet/outlet with a filter that has a 1-1/2” inlet/outlet as they would not be sized correctly or efficient when used together. You can also learn more about Single Speed and Variable Speed Pumps Here! While outside of this simple yet extremely import we get asked a lot about what HP a pump should be. That being said, it's important to know that pool pumps should really be rated by the gallons per minute of water flow instead of the motor's HP. Determine how any gallons of water your pool holds. You can use out Swimming Pool Gallon Calculator here. For this example, let's assume that your pool holds 24,000 gallons of water. As pumps are labeled with how many gallons they move per minute, you'll now need to divide the above number by 60 (as there are 60 minutes per every hour). Keep in mind that the desired time frame of turnover is between 8-10 hours, so you get a range by substituting the 8 hours used above, for 10 hours instead. This would allow a range of acceptable pumps instead of assuming only one options. You're now looking for a pump with a GPM range between 40-50 regardless of what the HP is. The GPM of the pump will go down the farther away the pump is in relation to the pool. Valves and PVC turns will also restrict the pumps GPM. Extra water features like spas, fountains, waterfalls, etc. will require a higher GPM rate which equate to a higher HP pump. Your pool pump's GPM will directly relate to your pool's filter GPM. You'll want your filter's GPM to be higher than your pumps to alleviate any additional strain on the pump motor. While some may think it's just easier to go with the highest GPM and HP and not worry about anything further, note that your pool's pipes can only take so much movement and pressure based on their size. For this reason, each pool has a maximum flow rate, which is determined solely by your pool's pipes. This means that you can have a pump capable of moving 100 gallons of water per minute, however, if the 1.5-inch piping will only allow 42 gallons per minute you risk damaging your system by creating too much strain on your pump that cannot move water as quickly as it'll be trying to. Your pool will most likely have multiple sizes of piping. You'll want to err on the side of caution and use the smallest piping for your pool's maximum flow rate. For example, if you primarily have 3-inch pipes in the plumbing system of your pool, but also have a spa with a 2-inch plumbing pipe, you're maximum flow rate would be 73 GPM. For more on Pumps, like the difference between single, two or variable speeds, try this article!